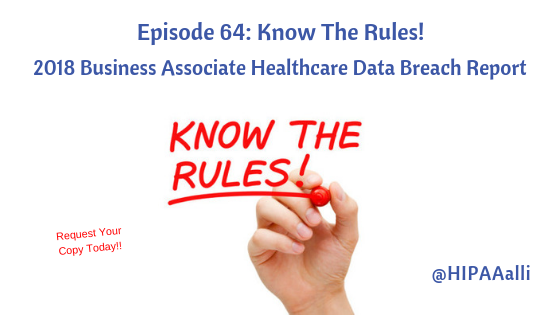 In “Episode 63: Know The Rules!”, I reported what I thought were all of the healthcare data breaches reported on the Health & Human Services (HHS) Office of Civil Rights (OCR) Breach Portal website by Business Associates (BAs) in 2018. The year 2018 was very bad for healthcare data breaches reported by BAs. Between January – December 2018, there were 39 different BA healthcare breaches added to the OCR ‘Wall of Shame’, potentially compromising the health information of 5,487,456 individuals. Seems I was wrong! Why is this and how did it happen? On January 9, 2019, after a quick review of the Breach Protocol website, I noticed a new breach affecting a health plan. Nothing new, but I knew this breach was a phishing attack on their BAs. In last week’s episode, I only reported the breaches identified as “Business Associate” under the Covered Entity Type report column. However, there were many more breaches hiding in the wings. That’s 71 new Business Associate breaches added to the ‘Wall of Shame’ and who now could have OCR in their business affairs – this is NOT a place you EVER want YOUR business to be in. But wait, didn’t I just tell you there were 74 different BA healthcare breaches? Clearly, you were paying attention; that is because 3 different organizations had already made the list in 2018!! Request your copy today of the ‘2018 Business Associate Healthcare Data Breach Report’ and find out who made the list.